Ezra Jack Keats (1916-1983) wrote so many wonderful books for children. I think most notable for me, as a children’s librarian in a school that serves mostly children of color, is that Ezra Jack Keats, although white, made his characters all African American. It is really refreshing to reach to my shelves and show my students books with children that look like them. 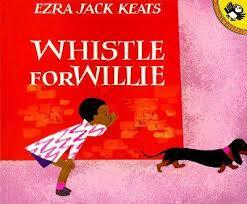 Of course, it’s not only that fact that makes me create multiple story times using Ezra Jack Keats’ stories. His books deal with universal problems that all children growing up face. I think he is so popular in my library today, because can relate to Peter and the situations he finds himself in. They want to whistle like Peter in a Whistle for Willie, or be friends with a girl without getting teased, like Peter in A Letter to Amy, or keep a snowball overnight like Peter in The Snowy Day or figure out how to deal with bullies, like in the book Goggles. Ezra Jack Keats wrote the following books: my favorite, The Snowy Day, as well as A Whistle for Willie, A Letter to Amy, Goggles, Pet Show, Peter’s Chair, Apt. 3, and John Henry and others. Snowy Day won the Caldecott Medal in 1963. If you haven’t read Ezra Jack Keats’ books for children, I think you’ll really enjoy reading them and introducing a new group of young students to his beautiful illustrations and writing.